Empiricus sat patiently on her 45-gallon drum cradle (that’s 55 US gal drums if you are American) all winter. We are ready to lift in and have been ready to lift for a few days now. We spoke with the crane operator and he told us he would be able to lift us in on Sunday (August 4). 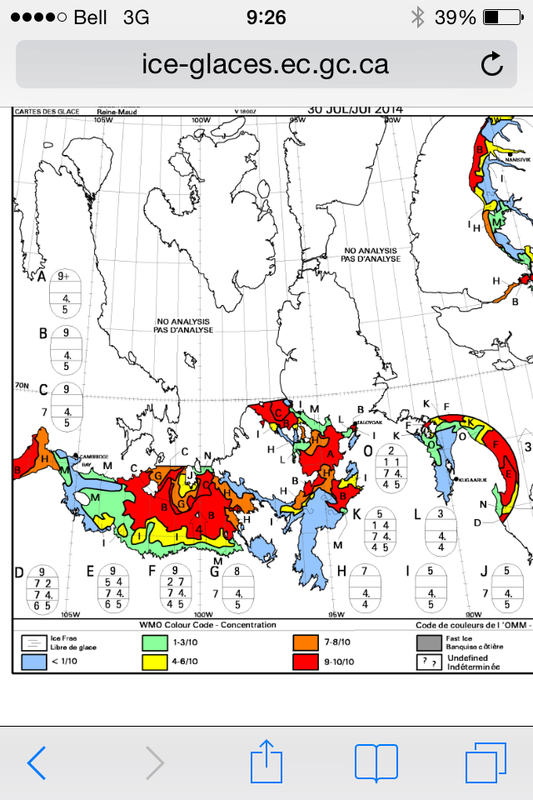 I did not realize until this year that the Canadian government puts out ice charts that detail the ice (or lack of ice) conditions in the navigable waters of theNorthwest Passage. Here is the ice conditions for July 31 . All of the red is 9/10ths ice cover. The white area to the north is so ice-bound that Environment Canada hasn’t bothered assessing it yet as it is still impassable. So although we were anxious to get Empiricus off the hard and into the water, we didn’t really have anywhere to go, anyway. It was still tremendously frustrating to be sitting in the cockpit of a perfectly serviceable boat, stuck on land. We spent some time visiting and gleaning information from the Captain of the other boat that over-wintered here, Gitana. He came through the passage from the East late last year and provided us with contacts, information and sage advice on the route we are about to set out on….as soon as we can get our damn boats in the water! Gitana is heading west and their route is much more ice-free than ours, so they are ready to get cracking. The night after we spoke to the crane operator, a big ole summertime thunderstorm rolled across us – wind, rain, thunder and lightning. Jesse hadn’t seen one since he was a kid in Oregon. I’m not sure if it was a highlight for him, as the boat shook on her cradle and the rain made our footings a mudhole precariously perched on top of a hill. I don’t think he slept at all for worrying about sliding into the ocean or toppling over. I was not troubled by these thoughts. What I thought was that if the boat was going to topple, I had better just sleep now while I could. The boat did not topple or slide into the ocean. I told Jesse my dream and we joked in the morning about the latter outcome being a backup method to launch into the water should the crane not pan out. Saturday came and went – the only activity being the delivery of a large excavator required to move some earth in front of our neighbour boat. We spent the day prepping should the crane come Sunday, though we were doubtful it would arrive at all. Sunday morning brought no news. We made plans to go into town, chop wood, meet up with friends from last year….but only after a nap around 4 pm. We woke to the sound of the excavator, well, excavating beside our neighbour boat. The crane had arrived while we were sleeping. Lift in! Empiricus lifting in to the water. We lifted in and cut the lines (seven short words to describe an hour long process to move a 38000 pound boat 16 feet over and two feet up.) Once on the water Jesse started the engine and then we were motoring across the water on the ocean. 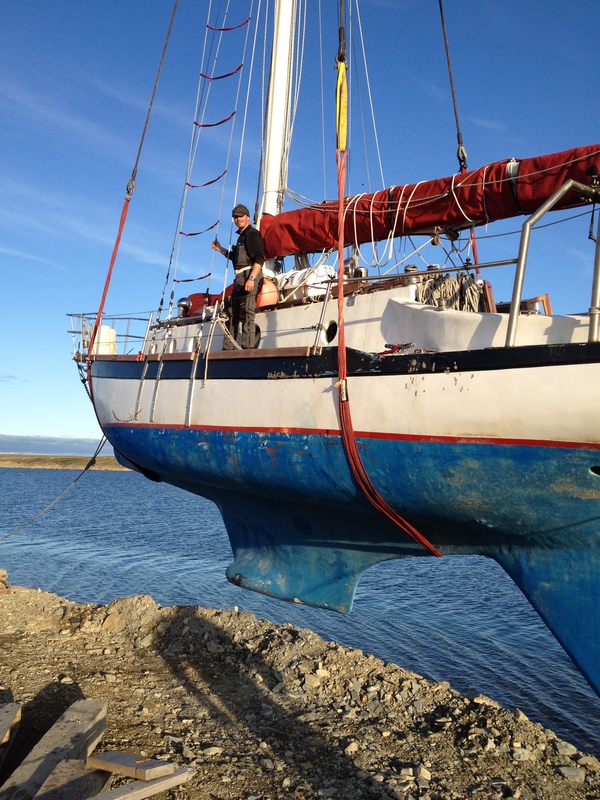 A huge grin crossed my face when Jesse said “Why don’t you take the helm for now?” My stomach flipped as I realized that now we really were going to sail away from the relative comforts of Cambridge Bay in just a few days. No more was it a distant thought. Our imminent departure was really happening. We still needed fuel, water and firewood though. I scoured the beach daily on our walks back and forth from town for decent looking firewood, and was rewarded for my efforts with a fine batch of dimensional hardwood. We raided the dump for pallets, too. Jesse ran the chainsaw and I bucked up our miniature wood into elfin sized pieces for our little elfin stove. Before too long we had a sizeable pile of wood. Perfect for me – I love being warm. 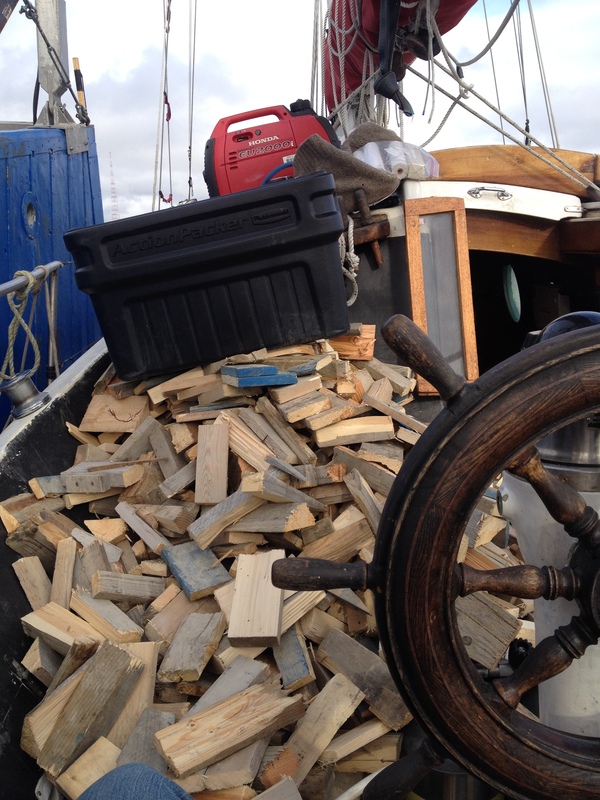 Our wood chopped and ready for stowing. The Hamlet of Cambridge Bay came down and filled up our water tank – 90 litres for $6.75. The diesel fuel was not quite as much of a bargain. A note to any other boaters coming through the passage – fuel is not always available for sale, especially towards the end of August before the supply barge comes in. 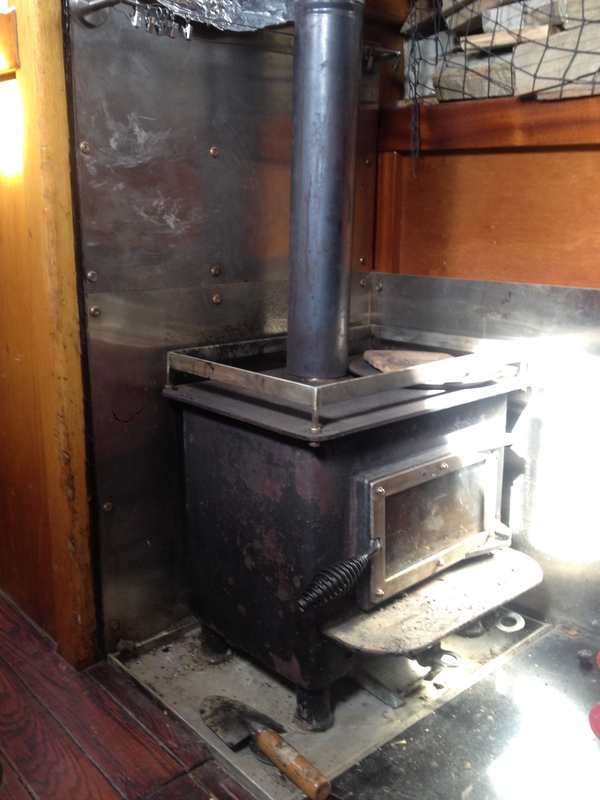 I am writing this post on the eve of our departure from Cambridge Bay. The ice chart from today shows much more open water, at least as far as Gjoa Haven, and the northern section is now assessed, although it is still shore-to-shore ice north of King William Island. Our route will take us to Gjoa, then north along the east side of King William Island, through Bellot Strait, then north through Prince Regent Sound, east around the Brodeur Penisula to Pond Inlet (although we may go north of Pond, depending on the ice) and then across to Greenland. We’ll then pick our way along the west coast of Greenland, to the southern tip, before heading north and east again to Iceland. We will be cautious and careful, taking our time. There is enough risk just sailing in these waters without adding to the odds. I have flown in the Arctic for nearly 10 years, and I have learned that one does not conquer her. You must be patient and humble. Respect the strength and ferocity of her weather, and have patience to wait for the right time to travel. If you are impatient you will be humbled. Such are the lessons of the Arctic. We have already discussed the very real possibility of not getting out of the ice in time this year…meaning we will come back to Cambridge Bay and try again. I think optimistically that we will get through to Greenland, but I know that being attached to the outcome is not a good mindset for decision making. Could you post the name and any contact information about the crane operator? I am representing a Baba 40, Lillian B, currently trying to get to Cambridge Bay from the east. I was on here from Maine to Beechy Island and they dropped me off in Arctic bay last Wednesday. Hi David – Kit Nuna is the company with the crane in Cam Bay. Good luck! © Samantha Merritt and samanthasails.wordpress.com 2014. Unauthorized use and/or duplication of this material without express and written permission from this blog’s author and/or owner is strictly prohibited. See the Content Usage Guidelines page for ways to share and use excerpts from samanthasails.wordpress.com.